It may hard to compete against Free software, but it is perfectly legitimate competition. In the Maureen O'Gara fiasco, you can see her role in overstating the legal dangers to the GNU GPL, as well as accusations against IBM. She “plants” articles for Microsoft. The word “plant” is actually used there in the leaked E-mail correspondence, which is a must-read. The courtroom seems like a convenient scene to fight Free software. There are just too many talented developers who are happily (and often voluntarily) working together, sharing code with little or no restriction. The antiquated consumer-producer role-playing is blurred, sometimes reversed. It’s a development carnival that it not artificially controlled by so-called ‘incentives to innovate’, i.e. intellectual monopolies that disallow use, limit sharing, forbid backward-engineering, discourage standards, and neglect users’ needs (feedback or patches). Microsoft found itself between A Rock and a Hard Place. It cannot beat its number-one competitor, which is gaining morale, attracting new users, and growing too rapidly, so it must quickly change the rules of the game. It needs to lobby for some new laws and then exploit defend or use these. There are other options too. Ironically, it’s the company so infamous for knockoffs that now accuses Free software of being a set of imitations, as opposed to reactionary code intended to prevent lock-in that’s imposed upon it. Many years ago came this admission of lack of originality from The Man who Wears a Sweater. Not much has changed since then. Those who saw products like Zune or Vista know that Microsoft just plays catch-up. On the Web, for example, it’s living in Google’s shadow and creating identical (and yet failing) services shortly after Google announces these. Here is a good quote from someone who has seen this pattern for decades. It’s time to be aware and point out that, while Microsoft is pretending to be part of the open source movement, its highly disingenuous and ambivalent role is showing. Like the boy who cried “Cancer!”, the European Commission no longer believes Microsoft. It’s all about AAABS. Sadly, some people are buying it. A few people investigate further and explore beyond press releases and face value to find out some truths. Microsoft itself is mocking “open source” in its very own formal reports, which are targeted at investors. That’s right. Here’s a short analysis of this paradox. Microsoft’s annual 10-K filing with the SEC has a few lines in it about open source as a competitor that has raised more than a few eyebrows. I’m scarcely surprised, especially since it highlights Microsoft’s schizoid behavior over open source. Here is Microsoft contradicting Steve Ballmer, who wants the world to believe that “Free” as in “Free software” means no money. “A number of commercial firms compete with us using an open source business model by modifying and then distributing open source software to end users at nominal cost and earning revenue on complementary services and products,” the Volish statement proclaimed. Matt Asay had more to say about the company’s deliberate (and probably bogus) ignorance. It would rather milk the aging cash cows than accept an inevitable change in business models, which would benefit both ‘consumers’ and ‘producers’ (a simplistic dual-role world). In reading through Microsoft’s annual report, I am struck by how far the company has come in appreciating the threat that open source brings to Redmond. Microsoft’s adjacent press in Redmond is stronger with its accusations. Rather than embrace FOSS as IBM did, Microsoft chooses to ridicule FOSS for being a copycat and an enemy to “intellectual property”. This proof of hostility is priceless. Microsoft lately has made some peace offerings to the open source world and even joined the open source Apache Software Foundation, yet the report depicts open source as top financial risk factor. Microsoft has warned of a growing threat to its business model from open source software. In its annual report the company said that it was facing increasing pressure from open source vendors, who Microsoft claims are stealing its ideas and benefiting from its intellectual property. A few days ago we also showed that Microsoft repeatedly expresses fear of GNU/Linux in its filings. Steve Ballmer called it the number one threat and Ozzie later confirmed that Free software is Microsoft’s main worry (not Apple, not Google, not even IBM, Sun or Oracle). In other industries, research continues up to a point where further research costs too much to be feasible. At this stage, the industry’s output merelyconsists of replacing parts that have worn out. However, in the software sector, a computer program that is fully debugged will perform its function forever without requiring maintenance or modification. “What this means is that unlike socks that wear out, and breakfast cereal that is eaten, a particular software product can be sold to a particular customer at most once. If it is to be sold to that customer again, it must be enhanced with new features and functionality.” This inevitably means that even if the industry were to approach maturity, any software company that does not produce new and innovative products will simply run out of customers! Thus, the industry will remain innovative whether or not software patents exist. In essence, as Professor Deepak Phatak would probably say, these patents are means for multi-nationals to loot the country. It’s colonialism or imperialism that’s marketed as beneficial or benign using Microsoft’s overseas workers and/or allies. It is not just software that is under attack. At risk of going out of scope, consider what is happening on the copyrights front and how it relates to software patents. We have extended copyright terms to the point of inanity–competition moves ever faster, to the point that technology copyrights and patents seem to be measured in decades. 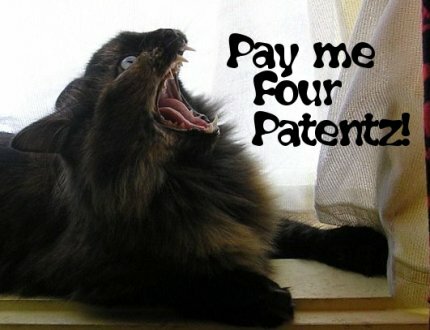 And then there is patent law, home of a widening array of specious, obvious patents. YouTube is at the moment somewhat of a centre of attention in the copyrights debate. Poisoning of the well is used as an excuse to stifle or shut down a competing business model. Groklaw follows this closely. If you can watch it without dropping your litigation against YouTube, Viacom, you need to see a doctor right away. Seriously. I hope YouTube lawyers play it for the judge if you insist on going to trial. Watch the part about the song that ended up being professionally released. It made the company some money. Cluestick: there is more than one business model, for those who can get with the new. Sooner or later, your shareholders will be furious with you if you don’t course-correct and modernize. Yes. They will. Eventually, your shareholders will be YouTubers, you know. And you’ll be what media used to be. I have decided to end the blog, after doing around 800 postings over about 4 years. This leads me to my final reason for closing the blog which is independent of the first reason: my fear that the blog was becoming too negative in tone. I regard myself as a centrist. I believe very much that in proper doses copyright is essential for certain classes of works, especially commercial movies, commercial sound recordings, and commercial books, the core copyright industries. I accept that the level of proper doses will vary from person to person and that my recommended dose may be lower (or higher) than others. But in my view, and that of my cherished brother Sir Hugh Laddie, we are well past the healthy dose stage and into the serious illness stage. Much like the U.S. economy, things are getting worse, not better. Copyright law has abandoned its reason for being: to encourage learning and the creation of new works. Instead, its principal functions now are to preserve existing failed business models, to suppress new business models and technologies, and to obtain, if possible, enormous windfall profits from activity that not only causes no harm, but which is beneficial to copyright owners. Like Humpty-Dumpty, the copyright law we used to know can never be put back together again: multilateral and trade agreements have ensured that, and quite deliberately. In setting up the rationalist background of his title, Professor Bently noted that the 2004 EC Staff Working Paper, the Gowers Report, and the EC-commissioned IVIR report had all approached the question rationally, with evidence-based and economic reasoning. Each had come out against extension. Cheating is bad, but does cheating infringe on a video game publisher’s copyright? World of Warcraft-maker Blizzard, a subsidiary of Vivendi, is trying to argue in court that it does. If this argument succeeds, it could change the way all software copyrights operate in the eyes of the law. This follows a similar move by Virgin, which earlier this year joined forces with the BPI on an ‘education campaign’ aimed at those sharing copyrighted files. ISPs have been under pressure from the government to work with the music industry in targeting illegal file sharers this year. Ministers have even threatened to introduce anti-filesharing legislation if a solution is not reached. France’s so-called Oliviennes strategy to combat copyright abuse includes a “three strikes and you are out” approach: offenders lose the right to an Internet account after being caught sharing copyright-protected music over the Internet for a third time. French President Nicolas Sarkozy wants to disconnect European file sharers from the Internet. The idea is already in the process of being realized in France, and will according to Sarkozy be a step toward “a civilized Internet” where ISPs watch the information that their customers exchange. La Quadrature du Net (Squaring the Net) has seen the draft “Trust Online” Charter (FR) that the Ministry of the Interior is asking ISPs to sign by June 10th. The text confirms La Quadrature’s worst fears. Under the pretext of protecting users, the French government is attempting to put in place an all-encompassing Internet monitoring and filtering system. It seeks to avoid the usual processes of law-making, in order to impose disproportionate obligations on the ISPs – obligations which violate fundamental rights and which are contrary to the ethos of the Internet environment. ISPs are calling on the record industry to put its money where its mouth is on illegal file-sharing, by underwriting the cost of lawsuits brought by people who are wrongly accused of downloading or uploading music. Schemes are being hatched to make it harder and harder to download copyrighted material across the internet. Seems they will be just as successful as the method to stop people recording CDs to tape in the “old days.” And just as ludicrous. The Canadian legislation, which could be introduced as early as next week, is expected to use the US Digital Millennium Copyright Act (DMCA) as a model. Stoddart notes that if “DRM technologies only controlled copying and use of content, our Office would have few concerns”. However, those same technologies can be used to collect personal information about computer users that is “transmitted back to the copyright owner or content provider, without the consent or knowledge of the user”. Copyrights and patents are government granted monopolies. They have their origins in the feudal guild system, not the free market economics of Smith and Ricardo. In fact, at the end of the 19th century, Switzerland and the Netherlands actually eliminated patent and copyright protection, with the intent of promoting free market competition. In spite of their feudal legacy, and their obvious status as forms of protectionism, few economists ever question the merits of the patent and copyright systems. The Pirate Party of the United States took a different position. “Being the lead counsel in a multi-year campaign of extortion, pretexting, and sham litigation should not be rewarded with a seat in any court, except perhaps as a defendant,” said the party’s chairman, Andrew Norton. Yet governments continue to push ahead with this idiot idea — both Britain and Japan for example are considering extending existing terms. Why? The answer is a kind of corruption of the political process. Or better, a “corruption” of the political process. I don’t mean corruption in the simple sense of bribery. I mean “corruption” in the sense that the system is so queered by the influence of money that it can’t even get an issue as simple and clear as term extension right. The counterclaims are for civil conspiracy, extortion, illegal investigations, computer fraud, trespass, deception, and abuse of process. Does She Look Like a Music Pirate? The boss of Warner Music has made a rare public confession that the music industry has to take some of the blame for the rise of p2p file sharing. After the lawsuit was filed, Njuguna said she boxed up the PC reportedly used for infringement and purchased a new one. She then filed a series of counterclaims to the RIAA’s lawsuit in an attempt to have the lawsuit dismissed and her name cleared. One of those accuses the record labels of failing to negotiate in good faith. Njugana also accuses the RIAA of engaging in deceptive and unfair trade practices, arguing that the record labels have demonstrated repeated behavior that has an “adverse effect on the public interest.” She also cites former RIAA defendant Tanya Andersen’s lawsuit (which seeks class-action status) as evidence that, unless the courts step in at some point, the RIAA will continue its campaign. The Electronic Frontier Foundation (EFF) filed suit today against Universal Music Publishing Group (UMPG), asking a federal court to protect the fair use and free speech rights of a mother who posted a short video of her toddler son dancing to a Prince song on the Internet.